Renowned Software Producer Rival Gaming recently announced the launch of their latest exceptional online slot called Ten Suns. This slot is themed on an ancient legend regarding a Divine Archer who saves the world from the scoring heat and will be accessible from March where it will be gradually rolled out to all Rival casinos on mobile and PC. New Ten Suns slot powered by Rival is a 5-reel, 25-payline machine that takes up an Asian mythological narrative about a divine archer. Originally there were 10 suns which, by mutual understanding, could illuminate the heavens only one by one. Thus, the 10 suns made their revolutions over 10 days, enticed by 10 strong dragons. But the 10 suns lost patience one day and come to a decision to go out at the same time to journey the sky simultaneously. The earth was not pleased about this and the effect of these 10 suns caused fires all over the globe. Nature and human beings suffered from this combined action but the suns were amusing and refused to admit that they were leading to the end of the world. Finally their father Di Jun Jun, who could not stop them, sent the divine archer who was equipped with a magic bow and 9 arrows. One by one he killed 9 of the 10 suns and left the tenth, which is the one we know today, alive to ensure the perennially of the world. The New Ten Suns slot reels are fixed on a red and gold scenery. Spinning in on the reels are characters from the Ancient myth and Oriental symbols including a beautiful Lotus Flower, the Emperor, a Beautiful Girl, Lucky Coins, a Lantern, a Chinese Dragon, the Phoenix, the Divine Archer, a Treasure Chest, Chinese Symbols, and the Golden Frog. The Divine Archer acts as the game's wild symbol expanding in any direction he shoots his arrow when he lands on reels 2, 3 and 4. He will also substitute all other symbols to form wins. The Chinese Dragon is the scatter symbol while the treasure chest is the bonus symbol. The Golden Frog icon is your highest paying symbol in the game offering 1,000 coins for spinning in five. Three or more treasure chest bonus symbols triggers a Treasure Chest Pick 'n Click bonus round. Select one to reveal multiplier cash prize payouts. Three or more Chinese Dragon scatter symbols launches the game's free spins round. You will receive 5, 7 and 10 free spins when you spin in 3, 4 and 5 scatter symbols to launch the round respectively. During the free spins round, all lower symbols are removed from the reels while the higher paying symbols act as drop icons and when they form winning combinations, they are removed for new ones to drop into place. 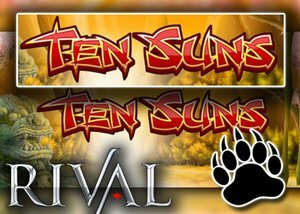 New Ten Suns slot is available to play at all Rival Casino. As an acclaimed betting review site, we at Grizzly Gambling vouch for Tropezia Palace Casino.This betting entity delivers a high end gambling experience defined by an average payout rate of 98.43% and access to a diverse selection of casino games. If you are a new punter grab the opportunity to lay your hands on a no code welcome offer of 100% up to C$100 on the first real money deposit. In addition, if you are fond of Rival Slots, you can also test your spinning and betting skills by indulging in a large selection of free Rival slots right here,right now.